You may have enjoyed WhatsApp in your smartphone, and that’s wonderful; but have you ever heard of LINE? A former student of mine who lives in Japan, of whom I have recently asked to install WhatsApp so that we can chat without pay (iMessage between Japan and outside of Japan is not reliable) alerted me of this wildly popular social networking and chatting App that became the Top App in Japan for 2012. It’s called LINE. I downloaded and installed it, used it, and WOW, much more fun than WhatsApp. It’s free, and guess why I am even writing about this App in this dachshund-focused blog? Because the App allows you to change the wallpaper to any particular chat, and thus far, two of the wallpapers have dachshunds on them! Here are the screenshots of the wallpapers; click the images for a larger view. Also, you can send, receive, collect, and buy “Stickers.” So what are these stickers? They work just like Emoticons and Emojis. Go try it out, and have fun; most importantly, get those dachshund wallpapers up and running! To download and install LINE, click HERE. Yours truly does not own a television set, so naturally I can be a tad bit behind in the cultural zeitgeist. As such, I had just started watching American Horror Story via Netflix. 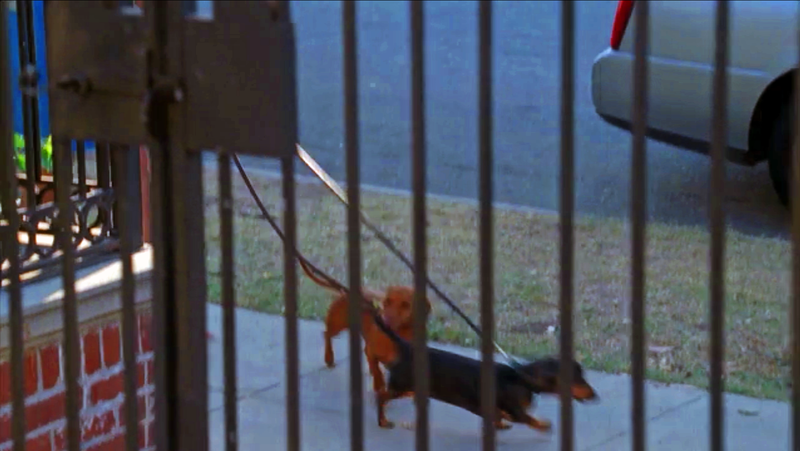 A few episodes into Season 1, I was pleased when I saw the character played by Jessica Lange walking two little dachshunds, which seemed to be one red and a black-and-tan smooth-haired ones. So far I’ve only seen her once walking with the dogs, and very briefly, too. Hopefully the two little darlings will make more appearance in future episodes and seasons. Let’s see if they are real dachshunds or ghost dogs, as other characters in the series turn out to be. What do you think? Dachshunds are not strangers to magazine covers. Here are some publications that I have found thus far; and as I find more, I shall add them to the gallery. These pictures are lifted from the Art.com site. All of them are available for purchase at that website. Perhaps I am the last one to find out about the sitcom Raising Hope and to see how entertaining the writing and the acting have been. One episode particularly caught my attention, as it is filled with all things dachshunds: Season 1, Episode 21. The episode concerns the Chance Couple discovering their neighbors’ private family affairs through their granddaughter baby monitor. Their subsequent investigation reveals the couple-in-question with three dachshund puppies (a brown and a white in the lap of the seated husband, and later on, a black/tan in the hands of the husband standing on the lawn); as well as a dachshund bumper sticker, and a couple of dachshund T-shirts. Here are some screenshots; enjoy! Regarding the last image (which does not come from the sitcom): I plugged in the image of the bumper sticker (from the sitcom) to see where it might be available for purchase. While it yielded none of that, I did find that last signage at Amazon.com: Click HERE to purchase it. 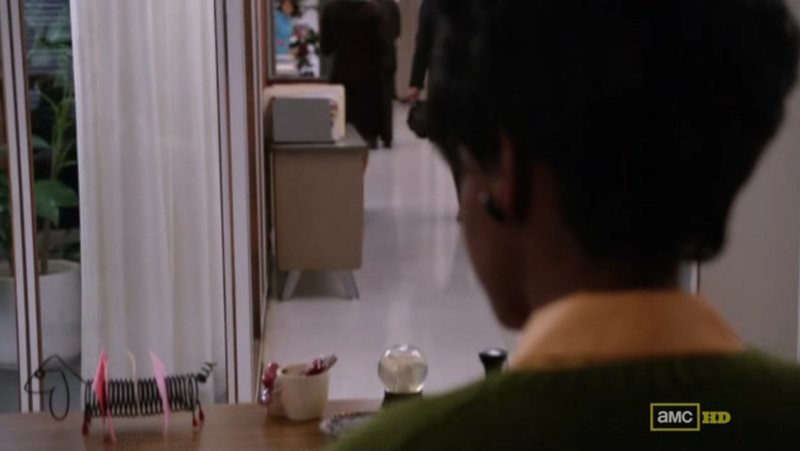 Here’s a brief appearance of a Dachshund Desk Organizer in an episode from Season 5 of AMC television series Mad Men.